The Content Production for Approval -task requires you to upload the content as specified in your individual offer. The brand will then review the content and provide you with feedback. You can also attach a note to your content describing your favorite pieces or other additional information. After submitting your content, wait for the feedback from the brand before posting. After the brand gives you feedback, you can post the approved content pieces in the respective posting period on your social media channels. To complete the task, upload the requested content to the Content Production for Approval -task that’s part of your individual offer. In case the brand accepts your suggested content pieces, you can then go ahead and use them in your campaign posts. Go to the Content Production for Approval -task in your individual offer and click on “Add content”. 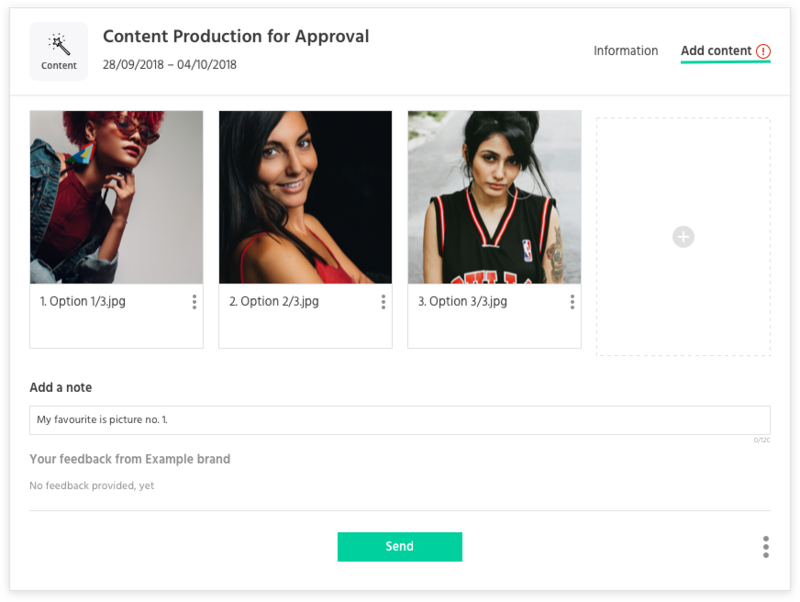 You can upload your content for approval in the Content Production for Approval -task under the campaign tasks menu.